In a soup pot, cook the bacon over medium low heat until nicely browned but not yet crispy. Add the butter and olive oil. Over medium high flame allow the butter to melt, then add the vegetables and herbs and sweat for 15 minutes until tender, stirring frequently to prevent browning. Add the flour and cook 10 more minutes, stirring frequently and scraping the bottom of the pot to avoid any sticking. Whisk in the warm, but not hot, clam stock and turn heat to high. Stirring frequently, bring the chowder to a boil and then reduce to a simmer. Add the potatoes and simmer 20 minutes until the potatoes are tender but not falling apart, then add the chopped clams left over from the stock. Add the cream, Tabasco and Worcestershire and return to a boil, adjust seasoning with salt and pepper. Serve immediately or refrigerate to reheat later. In a soup pot, combine all ingredients and heat on medium low flame. Allow the stock to simmer for about 30 minutes, until all of the clams are open. Strain the stock and set aside to cool a bit before using to make the chowder. Remove the clam meat from the shells and chop the meat and set aside. Discard the shells and vegetables. 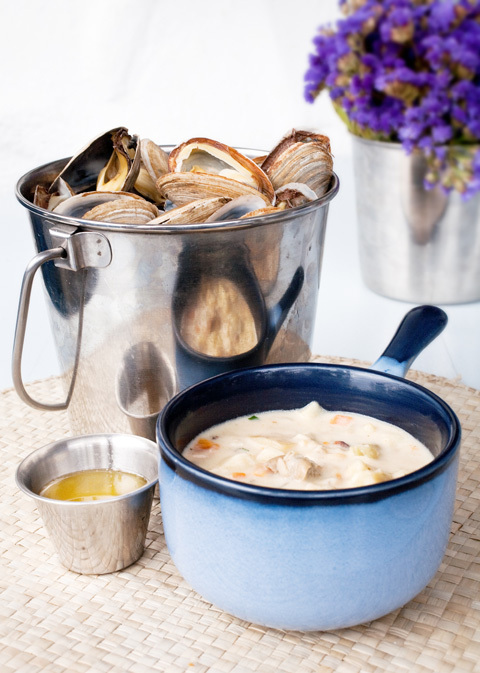 The stock can be made a day or two ahead of time and both stock and clams can be refrigerated until ready to make the chowder.